It’s not every day you see a cow lumbering down the interstate. But COBB COUNTY recently entered into a public-private “pardnership” when they called in backup — ranchers — to help them wrangle 70 cows off roadways after a cattle truck overturned, FOX 5 reported. The accident caused major delays during the morning commute, as the county fire department worked to free other cows still in the trailer and others chased down cows. 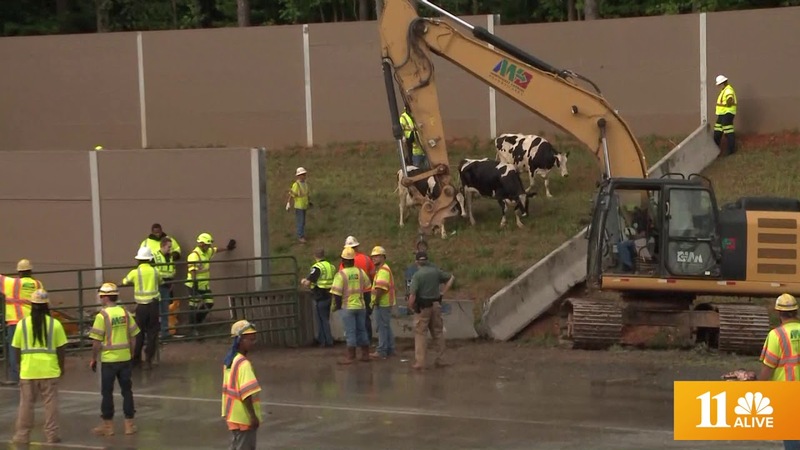 Police asked drivers to call 911 if they spotted a cow and the state department of transportation handled bovine transportation. News From Across the Nation is compiled by Charlie Ban and Mary Ann Barton. If you have news, email: cban@naco.org or mbarton@naco.org. • The MONTEREY COUNTY Board of Supervisors will consider a 60 percent increase in funding for its cannabis program, the Monterey Herald recently reported. Nine county departments oversee the local cannabis industry. The proposed $1.67 million increase would pay for eight new positions boosting the overall program to $4.4 million and more than 19 full-time positions. The increase would be funded by cannabis tax revenue. Cannabis program manager Joann Iwamoto said the proposed funding increase is aimed at allowing the county to employ “best practices” — particularly with regard to compliance and enforcement — in its ongoing effort to continue supporting development of the local industry. A Texas man’s search for the perfect spot to propose ended with the couple getting lost in the dark on a mountain in BOULDER COUNTY, CBS-4 reported. County Sheriff’s deputies rescued the couple who had flown into Colorado from Texas and hiked an 8.2-mile trail, a 3,000-foot elevation gain. A late start, little water and ill-equipped for colder temperatures, the couple became disoriented and got lost after the sun went down. A hiker found them, took them to his camp where other friends gave them water, food and shelter. Another hiker descended the trail to get 911 service and county sheriff’s deputies responded. They arrived at the trailhead and their rental car at about 6 a.m. They didn’t require further assistance — and told deputies the engagement is still on. Beaches in the Gulf Coast counties are waiting to see how Hurricane Michael affects the red tide that’s been plaguing the area. “There are two possibilities,” David Hastings, a professor of Marine Science and Chemistry at Eckerd College, told CBS Tampa affiliate WTSP. He says the different scenarios come down to the wind and the amount of rain. “The hopeful one is that strong winds from the hurricane blow red tide offshore,” Hastings said. If Hurricane Michael turns into a rainmaker, it could be bad news. “The heavy rain will dilute farm and agriculture areas of all the nutrients, nitrates, phosphates and rain them into the beaches and coastal areas that serve to fertilize the red tide — exactly what we don’t want,” he explained. Rain and runoff could turn the already 145-mile-long toxic algae bloom that stretches more than 10 miles out into the Gulf into an even bigger problem. The MONTGOMERY COUNTY COUNCIL was expected to introduce a bill that would ban smoking in outdoor or partially enclosed dining areas, Bethesda Magazine reported. The proposed bill would expand on two laws banning smoking in the county. One passed in 2003 prohibits smoking in most indoor locations and another passed in 2011 bans smoking within 25 feet of a playground located on private property as well as in common areas of residential dwelling units. A public hearing is scheduled later this month. Motorists in 26 mostly rural counties will no longer be required to have their vehicles tested for emissions. Gov. Roy Cooper (D) signed a bill approved by the Environmental Protection Agency allowing nearly 2 million people to avoid the $16.40 charge for the test, after the state department of environmental quality noted a significant improvement in the state’s air quality, the Shelby Star reported. Urban areas, such as MECKLENBURG, WAKE, GUILFORD and FORSYTH counties and their surrounding suburban counties will require emissions testing. The CUYAHOGA COUNTY Library received a $50,000 grant from the Google Impact Challenge, the first county government to win such an award. Google already handed out $50,000 apiece to four organizations that work in the community; the company allowed the public to vote on who would get an additional $50,000. The Cuyahoga County Library will use the money to launch an internet hot spot program, which will allow students in high school equivalency classes to take home a free mobile internet hot spot. The program will start this fall, with around 200 mobile hot spot devices distributed through the library branches and other community sites, News 5 Cleveland reported. • MARION COUNTY has joined a lawsuit challenging the Army Corps of Engineers’ plan to drain a large lake to build a cooling tower. A federal magistrate OK’d the county to join the lawsuit filed by the state’s capital city, Salem. The county’s economic development coordinator says 70 percent of jobs in the area are recreation-based and could lead to an $11 million loss in those industries annually. The Corps is performing the project to correct water temperatures in the North Santiam River and aid fish passage as part of a legal agreement reached in 2008, the Statesman Journal reported. • Library card holders in MULTNOMAH COUNTY have a new benefit — free movie streaming at home. The library’s agreement with Kanopy, an on-demand streaming video platform, allows users to choose from more than 30,000 films, limited to six three-month “rentals.” Selections are primarily foreign films, classic movies and documentaries, Willamette Week reported. The library recently also debuted the Library Music Project — a collection of Portland-made music. CLEARFIELD COUNTY emergency dispatchers are trying to identify some dogs whose barks have been crowding radio communications. Authorities told WJAC News they believed the audio overlay was a radio error, but posted clips of the barking to the department’s Facebook page in hopes that residents might recognize the barks and identify the radio responsible for the interference. A federal judge has ordered the DALLAS COUNTY jail to stop setting bail without regard to whether suspects can pay. U.S. District Judge David Godbey told the county it must provide suspects booked at its jail with an individual hearing within 48 hours if a magistrate judge doesn’t release them after they’ve indicated they cannot afford bail, the Dallas Morning News reported. Commissioners have responded by expanding the county’s pretrial services office, adding intake technicians and staff to administer a risk-assessment tool that will aid magistrates in making bail decisions. Citing a Virginia Economic Development Partnership report saying the state lacks “shovel-ready sites,” LOUISA COUNTY is planning a county-owned business park. In addition to attracting commercial development, the county hopes to reduce residents’ commute times. The Daily Progress reported that more than 60 percent of county residents travel for work. In a measure similar to what was passed in Seattle, the KING COUNTY Council has passed an ordinance requiring all gun owners in the county to store their firearms in gun cages or lock boxes. Violators face a potential misdemeanor charge and a potential fine of up to $1,000 or a maximum of 90 days in jail, Seattle Weekly reported.